Estate agents raises £22,000 for hospice charity in a week! 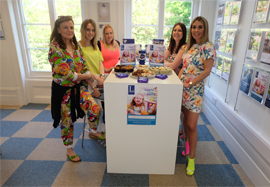 National estate agents Leaders raised £22,000 for its charity partner Together for Short Lives during the recent Children’s Hospice Week. Staff from all of 124 Leaders branches across the UK took part in a variety of fundraising activities, including cake sales, coffee mornings, raffles, car washes, cycling challenges, marathons, sponsored walks, games, competitions and a sponsored silence. Leaders also invited its landlords to donate a day’s rent in support of Together for Short Lives and hundreds did so, raising thousands more for the charity. The £22,000 raised in just seven days from 22nd-29th May will contribute to the company’s fundraising total for the year, when it is aiming to raise £50,000 just as it did in 2016. Allison Thompson, managing director at Leaders, says: “Hundreds of our staff combined imagination and hard work to hold a plethora of fundraising events during Children’s Hospice Week, raising more than £22,000 in the process. “Having worked with Together for Short Lives since 2015, we know exactly how important this money is and the difference it will make. The charity supports children with life-threatening and life-limiting conditions and we are delighted to be able to help. “All of the money raised by our branches will go to their local children’s hospice service, so people know they have had a positive impact helping seriously ill young people and their families in their home county. Together for Short Lives is an umbrella charity for all 54 children’s hospices in the UK. Each Leaders branch is paired with its local hospice and raises money on its behalf. Nick Appleby, Head of Corporate Partnerships at Together for Short Lives, said: “The incredible support shown by Leaders, their staff and customers during Children’s Hospice Week has been truly inspirational!